Did you know that the wrong pair of shoes can land you in a CAT scan machine for running injuries? Sorry for the blatant scare tactic, but this actually happened to one of my best friends. If this post spares one person from having a similar experience, it will be worth it. As my friend learned the hard way, hitting the road in the wrong pair of shoes can severely damage your joints and connective tissues. Each person’s feet require a specific kind of support from their shoes. Which is why it’s so important to know yourself as a runner before buying shoes. After years of casual running and consulting my marathoner friend, here are the questions I’ve found most helpful to guide your shoe shopping. How high is my arch? Your arch takes a lot of abuse. Buying shoes that compliment it will give you better balance and support. 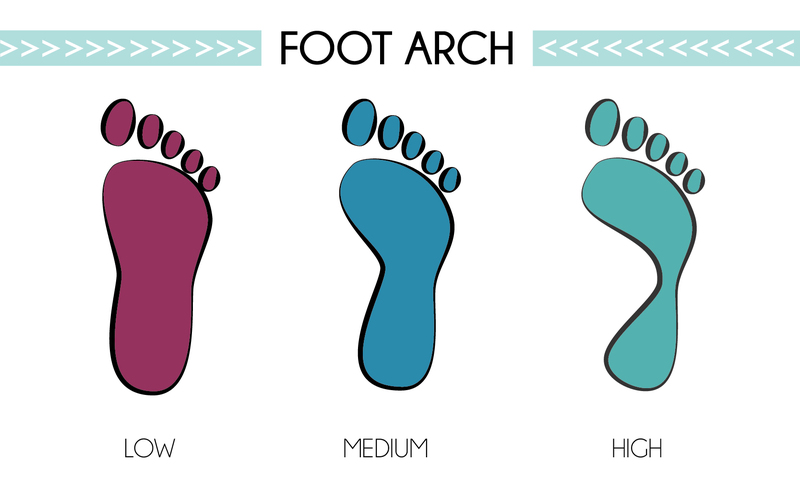 The three arch types are: low, medium and high. To find out which one you are, get a sheet of paper, wet the bottom of your foot and stand on the paper. There will be a wet impression afterward that reveals your arch. Which way does my ankle roll? To find the right running shoe, know which way your ankle naturally rolls to absorb shock. The roll is subtle enough that you may not notice it while running, even if you’re trying to pick it out. The easiest way to find out if your ankle rolls is to grab a pair of well-worn shoes and look at the sole. I am a supanator, as you can see from my shoe below. Look how smooth the outer sole is while the inside still has grooves. This means, I need running shoes with more cushioning on the outside, helping absorb the pressure as I roll my foot outward. What I’ve found work best are the Aesic gel Nimbus shoes. They have gel cushioning on the outter heels to soften my heel roll. Where does my foot strike? 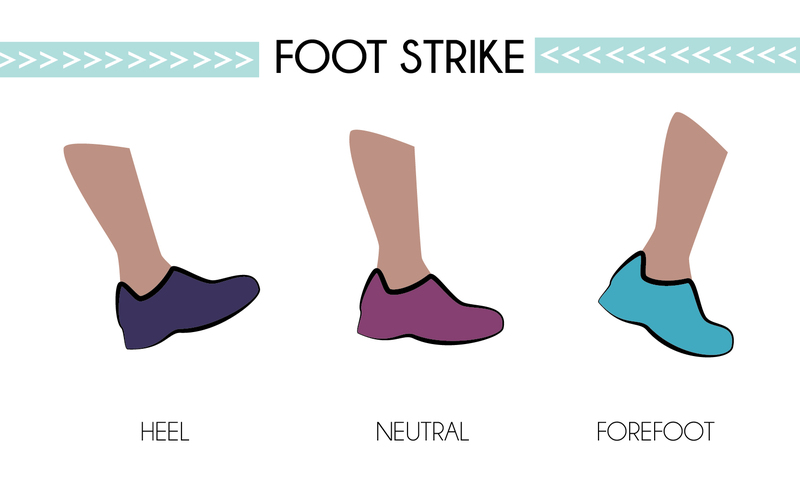 Are you a heel, midfoot or forefoot striker? To find out, have someone watch you run. Don’t think about correcting your form, just run naturally. Ask them to watch for which part of your foot touches the ground first and last. Heel striker: your heel is the first thing that strikes the ground with the rest of your foot following. Sorry to break it to you, but this is probably the most inefficient way to run. 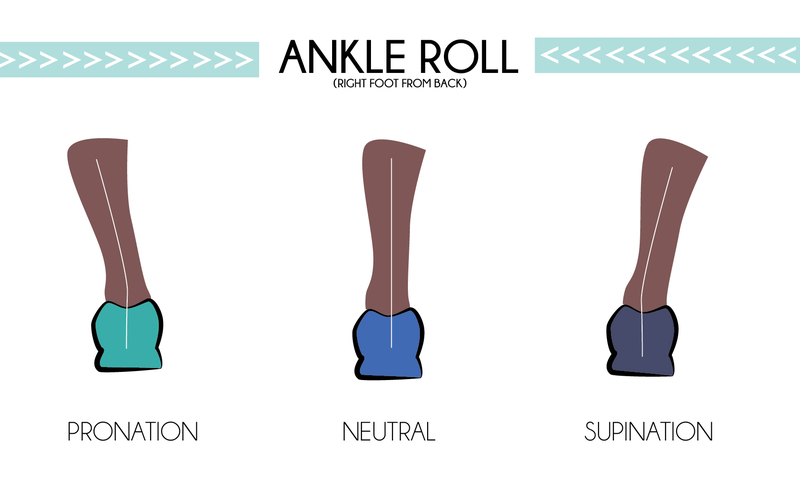 When your heel strikes first, it creates a stiff impact that sends shock absorption up your leg, into your joints. This creates a natural braking effect, causing you to lose forward momentum. If you’re a heel striker, look for shoes with plenty of heel cushioning to help absorb shock. You may also want to consider training into a mid or forefoot strike. Midfoot striker: your foot strikes nearly even each time you stride. You don’t travel toe-to-heel or heel-to-toe. With this type of running strike, your feet land almost directly under you, keeping your body mass centered over your feet. There’s much debate over whether a midfoot strike is any better than a heel strike. My advice is to try it out yourself. If you feel continual joint tightness, change your running strike and buy shoes to help you transition. Just know, altering your stride is a long process. It’s breaking down one habit and building another. Forefoot striker: the front half of your foot hits the ground first, with your heel touching after. Many argue that this is the healthiest running stride. It propels you forward more than heel striking and absorbs more shock, sparing your knees. When I run long distance, I use a forefoot or midfoot strike. Transitioning to a forefoot strike can be painful. You’re basically switching to a calf press every step. So, you’re likely to experience sore Achille’s and calves at first. But, it could be worth it in the long run (hehe) if you decrease your time or experience less joint pain. What terrain do you run on? Your answer could decide which shoe you choose. Trail runners can wear shoes with less cushioning. Dirt or gravel paths offer a bouncier, more shock absorbing surface. You may also be looking for high traction shoes if you’re pounding gravel regularly. In this case, you’d want kicks that are labeled as trail shoes. They have higher grip soles and more durable fabric for a rugged run. For runners who boss concrete sidewalks, a higher cushion shoe is a better choice. Concrete won’t offer any give, so you’ll want a shoe that does. Do these shoes fit right? When you run, you feet naturally swell up. This effects the size of shoe you buy. 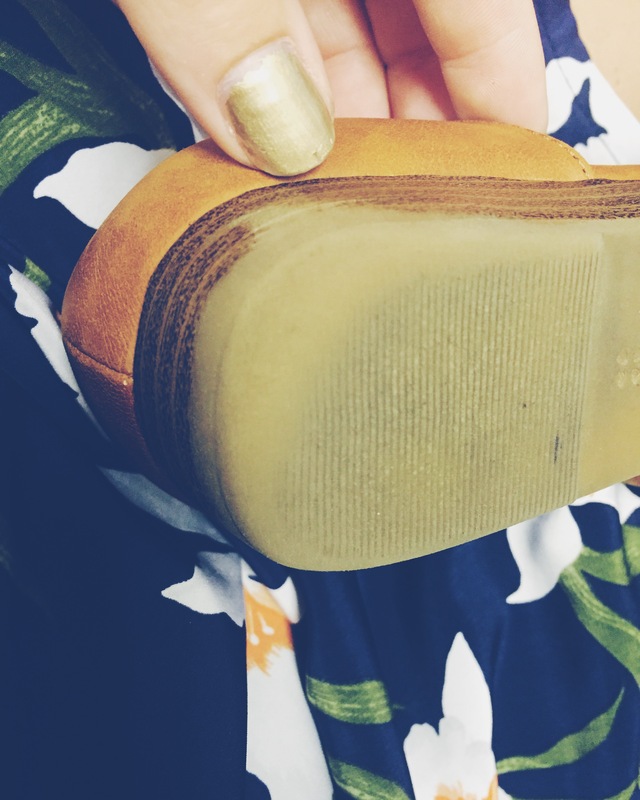 Look for a fit that allows about a thumb’s space between your toe and the tip of the shoe. But, don’t give enough space that your foot is slipping around inside. Think: “snug, not tight.” It should cradle your foot’s contours and provide balanced support. Make sure you actually run in the store before buying shoes. It may look kinda dumb, but you’re investing some serious money into theses suckers, so you want to be sure they’re the perfect fit! Hopefully this post gave you some helpful pointers on choosing your next pair of running shoes. If you need more guidance, try using Runner’s World’s shoe finder. It’s a fantastic (free) resource! What are the best running shoes you’ve ever had? Yes, I am so loyal to one brand and model! Wish there were better sales on running shoes though. It can definitely get pricy to invest in some. for sure. i’ll face that next time my current batch wears out..
OH man I have struggled with finding a good running shoe for a long time. Great post. Thanks for the info. When I first started running I had my Gaint analysed at two stores. Both recommend different shoes. I spend months suffering ankle, knee, shin and hip issues never mind the blisters and hot stops. Then minimalist running started to make a very quiet entrance to the running scene. I was have such issues running that I decided that these less structured and supportive shoes could be any worse that what I’d been told to run in. It was a revolution, my blisters reduced, my shins and knees were happier and running became very enjoyable. However, my calves would cram and ache. After 5 years of minimalist running I’m strong, more felixble and faster. I am now transitioning to a more cushioned shoe knowing that my feet and ankles are strong and felixble without the need for artificial​ support. I’d certainly recommend minimalist running – in small chucks – to anyone who is suffering too much when running.